Balance your system before asking about foamy and/or flat beer! If you don't have the correct line size and length, and your beer is at the wrong temp and pressure, you will not be able to serve your beer properly. Buy proper beverage tubing, not cheap tubing from the hardware store. Thank me later. Here is our current kegerator. 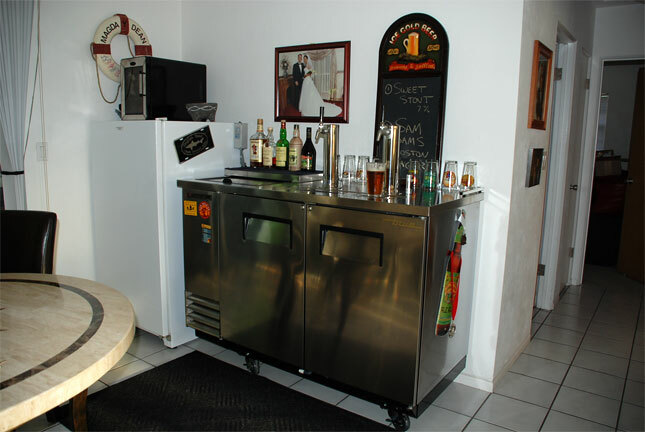 It is a True TDD-2CT-S Stainless Steel Draft Beer Cooler. It currently has two towers and four taps. 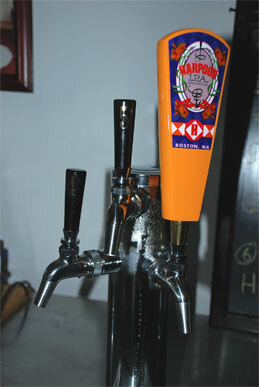 The newest towers and taps are not shown here. It is a true work of art. The craftsmanship is superior to our other unit by Bev-Air by far. The only limitation we have found is that the cooling unit at the upper rear is too low to allow corny kegs with disconnects on them to sit back all the way. This is really not much of an issue, but it is less versatile than the Bev-Air units. Plenty of room in the front for kegs that are being served anyway! 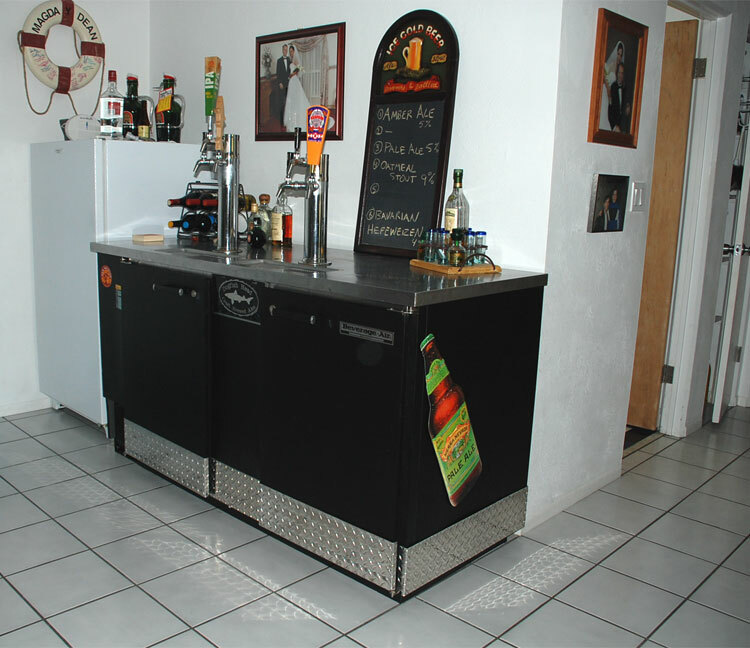 It is much quieter and more efficient than the Bev-Air, and that is great because this sits beside the TV viewing area! We estimate that it can easily hold 8 cornies and our 10lb CO2 tank, with room for bottled beer and extra glassware inside. The stainless was worth the extra few hundred bucks for sure! 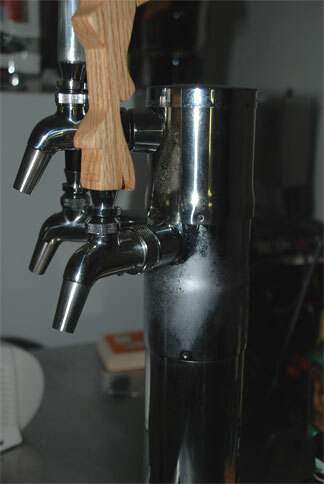 Our previous kegerator is this older Beverage-Air DD68. 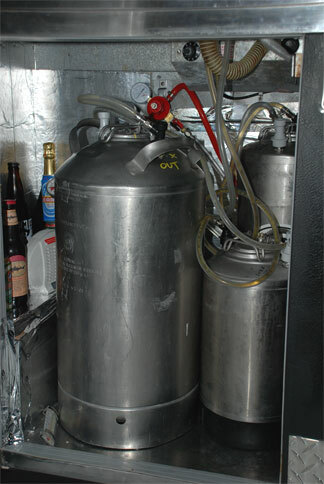 It has 6 taps, and a capacity for at least 10 corny kegs, and 8 commercial 1/6 kegs, not including the shelf over the compressor that can hold up to a 10lb CO2 cylinder and some bottled brews. This was originally used in a restaurant. We did some rehab and improvements before we decided to keep it. 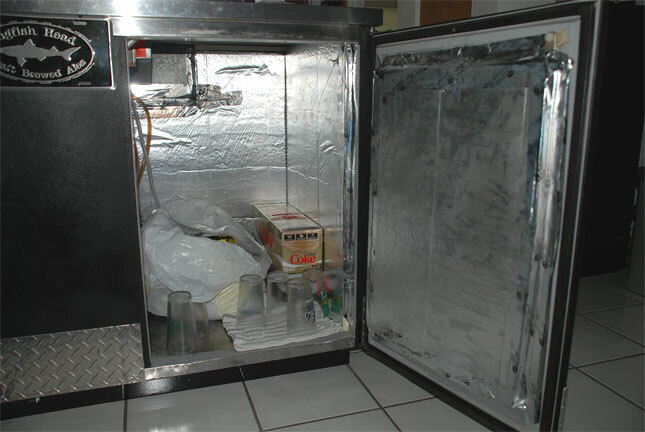 You can see in the pictures that we have double-insulated the interior walls and door panels using foil-covered insulation board. We had to re-plumb the drainage from the condensor and the drip trays to drop into a jar rather than out on the floor as these units were not meant for homes. We also coated the entire underside and front lower rim with POR-15 to prevent any rusting. We also treated the interior panels with POR-15 at critical points to prevent any rusting in the future. The diamond-plate was cut and bent at a local metal shop, and slightly wraps around the corners for a really nice finished look. The logos are just mounted with magnets, nothing permanent. We sold this one in February 2008 in anticipation of our new arrival. This unit originally came with two towers, and one was a "shotgun" tower with the taps really close for filling pitchers which is useless for us. We used tower adapters to first cover the shotgun tower on the left side, and then single adapters on top to add the 5th and 6th taps. The adapters were much less expensive that buying new towers. The towers have forced-air cooling to stabilize temps and reduce foaming. We use a variety of keg sizes as you can see here, we also stock some bottles. The big keg is a 10 gallon, the ones beside it is a 3 gal, and the others not really seen are common 5 gal cornies. We have a 3-bank secondary regulator in the back that feeds another 4-outlet manifold for the 6 taps. We have no need for 6 different serving pressures, so 3 regulators work well for this. We have a 10lb CO2 tank in the back. 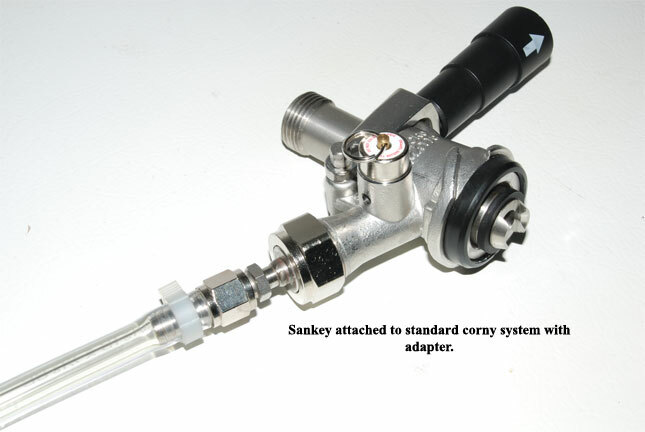 We also have a separate CO2 tank and regulator for force carbonation and closed-system transfers. Even with lots of kegs in there we still have room for other stuff like a big bag of various hops , some soda, and our chilled glassware. 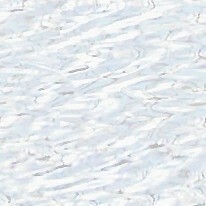 You can see the foil-lined insulation panels better in this photo. We are considering a door-mounted glassware rack when we find something suitable. This open space won't last for long as we are shutting down our other kegerator soon! If you are thinking about getting one of these, consider the fact that they are not efficient like a chest freezer. Our electric bill went up $100 the first month!! This is double what we regularly pay, and might be the reason we go back to a chest freezer with a collar! 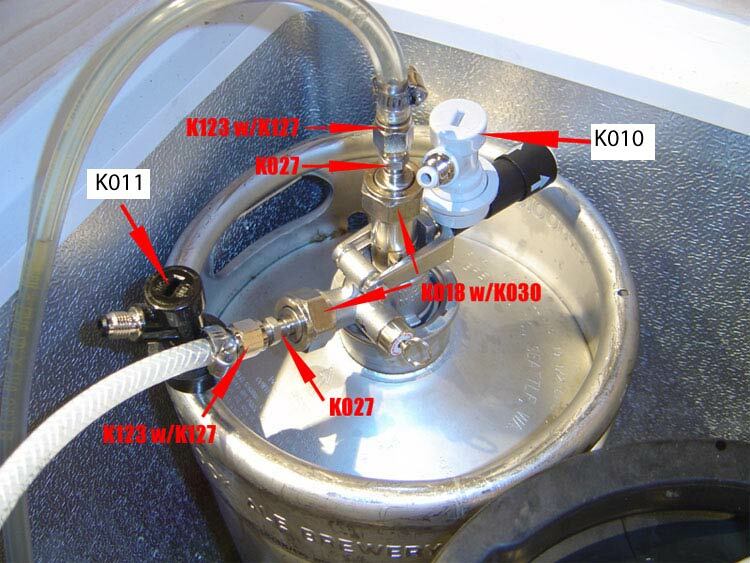 Unless you only plan to serve from a single type of keg, you will need an easy way to switch out the corny keg disconnects with a commercial keg coupler. Below are pics of the hardware required to do it correctly, and easily. 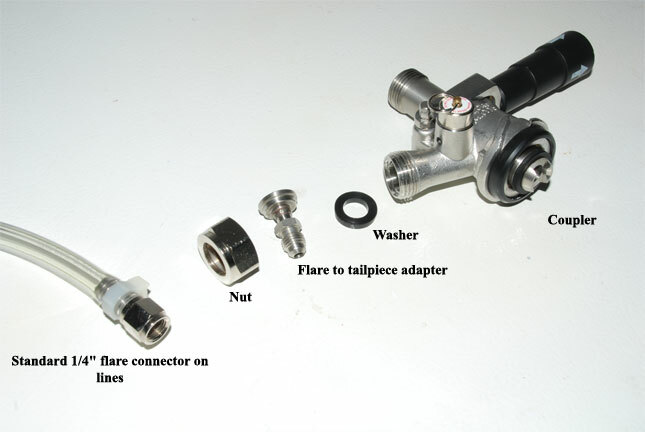 All parts shown can be found at MoreBeer, Northern Brewer, Austin Homebrew, Williams Brewing, and other decent homebrew and draft beer supply stores. Part numbers in picture are from Northern Brewer, photo is from a user on their forum.